Monday Finish and Find Giveaway! This week I worked on the new blocks that Stacy of Buttermilk Basin has been offering for free each month. 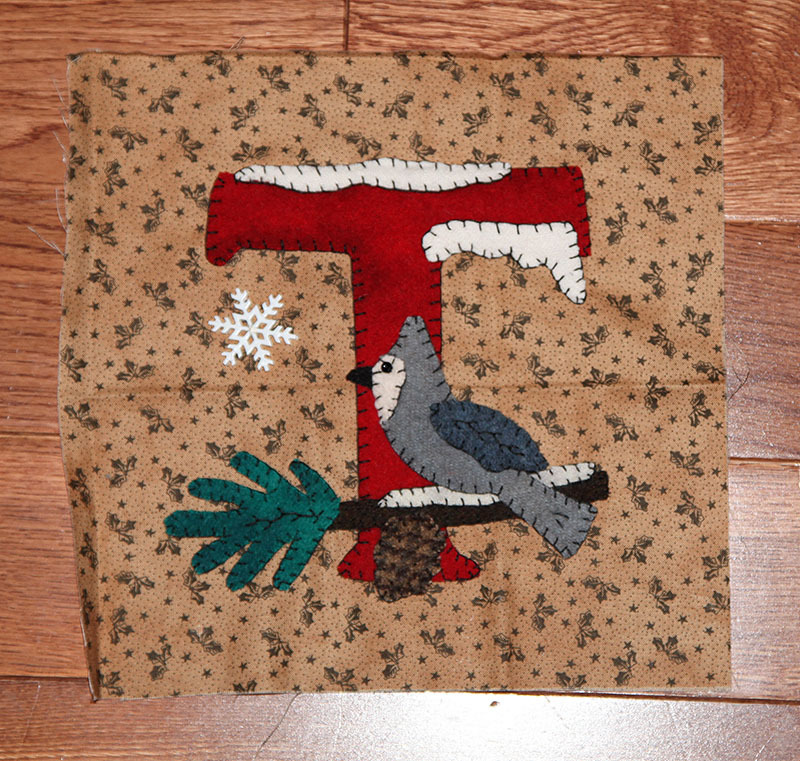 This month it was a snowflake block and the letter I. I know this is one project I will finish and enjoy putting together. It is going to make a wonderful wall hanging for Christmas. 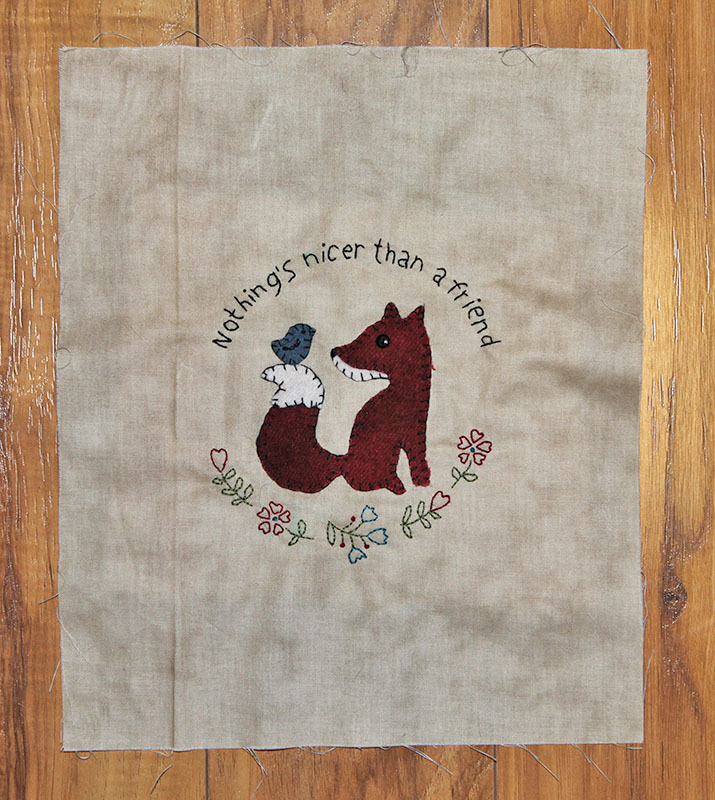 I also decided to try a piece by Bustle and Sew called Friendly Fox. 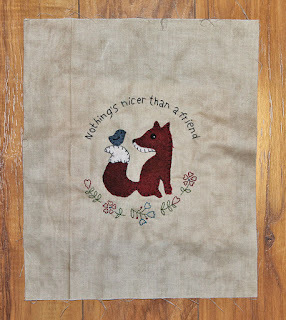 I love the fox and the saying, a perfect gift for a friend. I am not sure how I will finish it yet, I was thinking it might make a nice sachet, with some lavender. I also did the flowers in simple stitchery, the original is done with embroidery stitches and filled in. I hope everyone has a wonderful weekend. 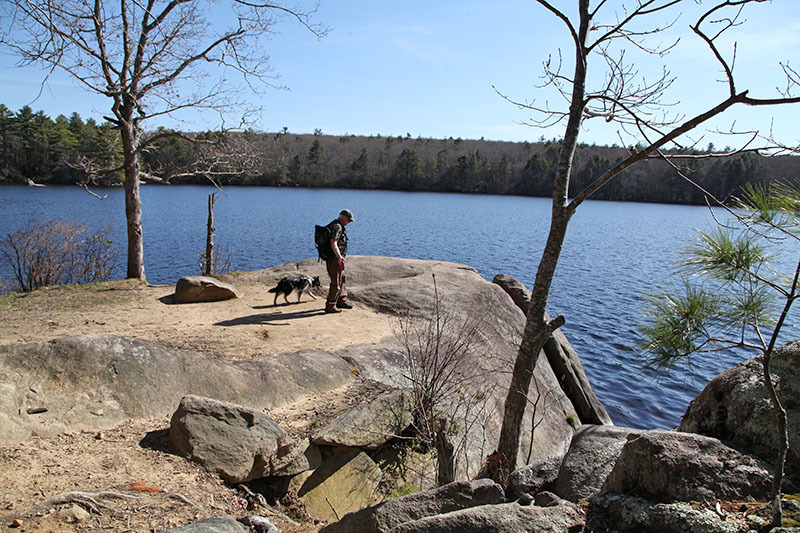 We have one nice day, then rain, so hopefully we can get out and explore tomorrow. 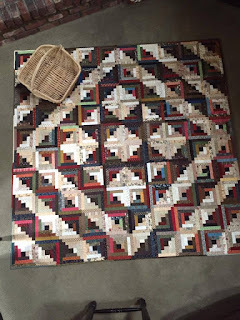 There were a lots of nice quilts but I know we all see the same things most of the time so I picked a few of my favorites that are unique for different reasons. The first is an angel, but Barbara Barbara. She had a few of her painted pieces in the show, but this was different from what she normally does. 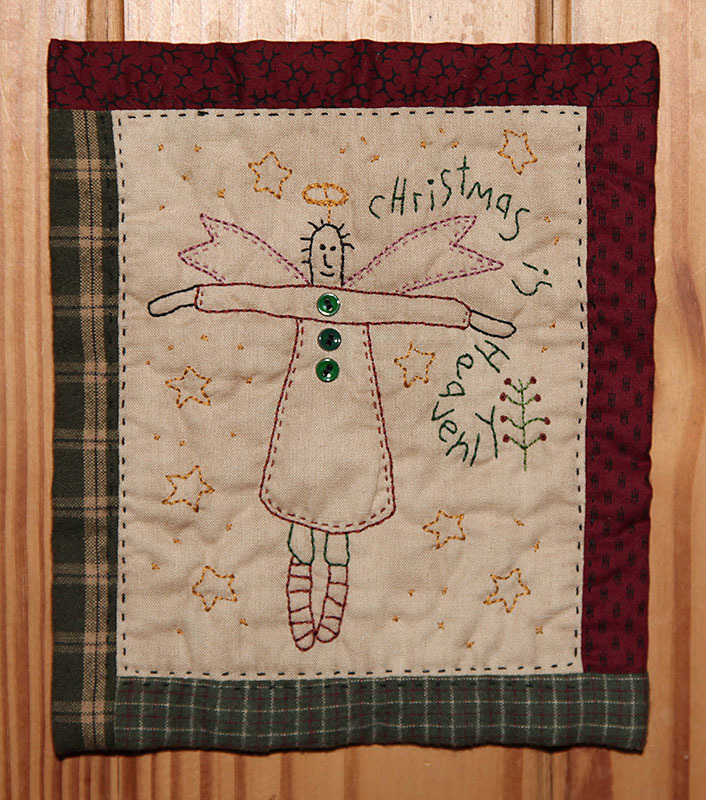 Nice idea if you are interested in doing a piece for your church, lots of free angel images online. 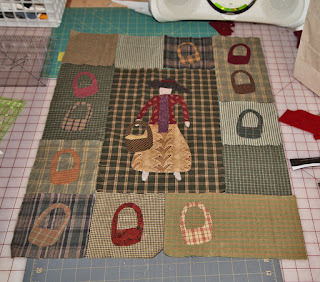 The next few quilts were done with quilts bought from the New England Quilt museum. 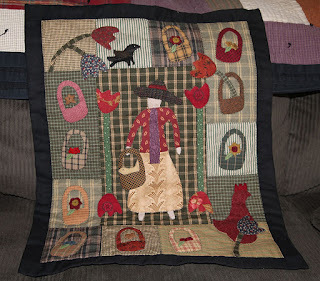 Love seeing old quilts and these were tops that were sold and the ladies quilted them. This was my favorite, love the design and fabrics. 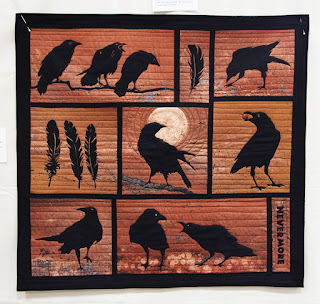 Unique quilt and great for scraps. 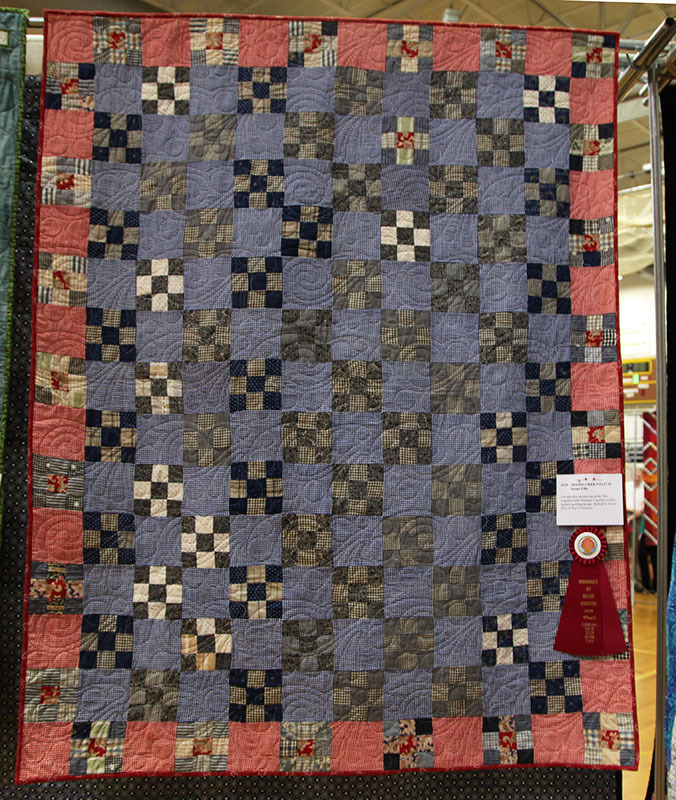 The next two are examples of quilts you can make from used clothing, especially from a loved one. 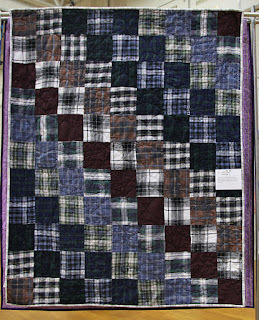 Something to cuddle in, when she misses her dad, all from his flannel shirts. 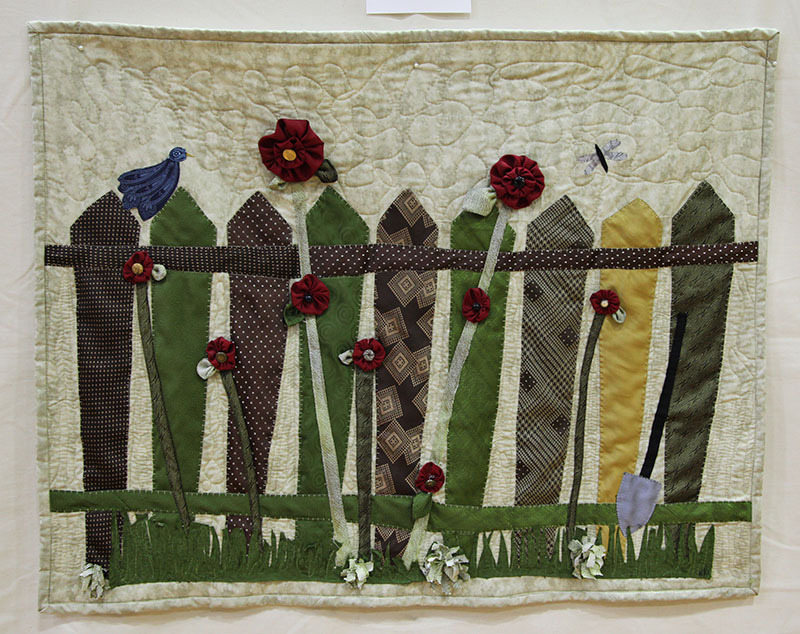 A unique way to use ties in a quilt, love the fence idea and ties could be made into other types of designs for art pieces. This piece is wonderful, a style I would love to make. She used a resist to bleach out some color in the background. And for you wooly lovers, a Heart to Hand design, it was really gorgeous in person. Beautiful wools and beautifully made. And last but not least, was a quilt made by my friend Tina. 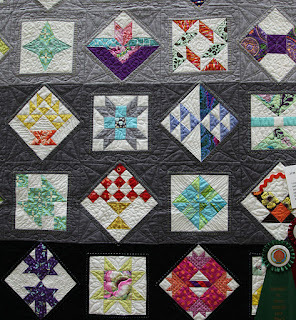 She does beautiful work and I loved how she used the graduated colors for the background and then hand stitching around the blocks, then beautiful quilting around that. 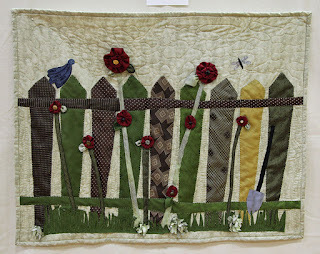 I like the idea of doing hand stitching to enhance some of the designs, mixed with machine quilting. 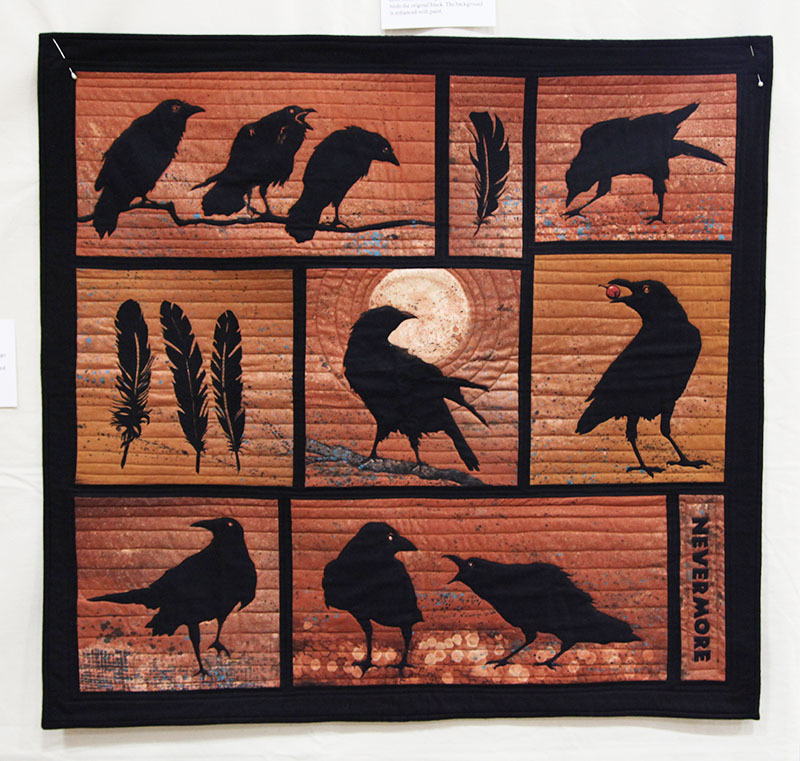 This is just a section of the quilt, it is huge and i wanted to show the work close up. This weekend was busy, I was on the go more than usual, but that is a good thing. 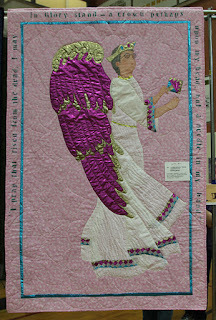 On Saturday we went to the quilt show and I did take photos but not too many, so tonight I will show you one and what I bought and then I will do an extra post on Wednesday with a few more quilt photos. I wasn't too impressed with this show. 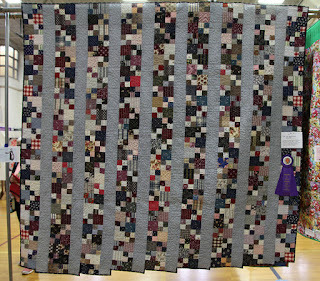 There were some beautiful quilts but a lot of quilts that look like they were made and put up so they had more to show. The displays were not done too well either, a lot of the quilts were crooked or wrinkled up. There were some good vendors but mostly from local shops and machine stores. It seems you pay to get in, and then you have vendors and raffles and food and I assume they make money from them too? 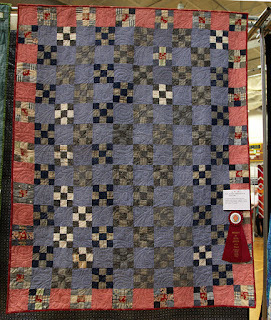 But it was fun to go and see the quilts but I wish they had more vendors from out of state with more variety. 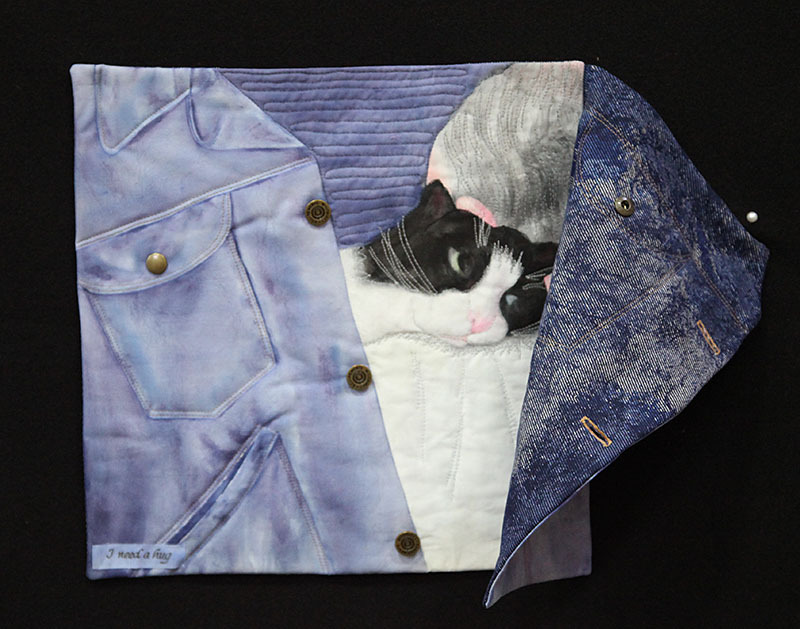 I will show you one quilt that I just loved because I love cats and I love the creative use of materials on this one. This would be fun to do with old jeans and maybe a fabric printed photo of your own pet. Even thought I don't need to be buying more fabric, I couldn't resist. I loved the cat print and it is a good piece to practice my machine quilting on, then I got the stripes and print to add for border. I am not sure I have enough though and I realized the panel goes longer across, so I will have to cut it into blocks to make it work as a quilt. The dragonflies just spoke to me and the blue batik will be alternate blocks, I have plans to make an inspirational piece with them. 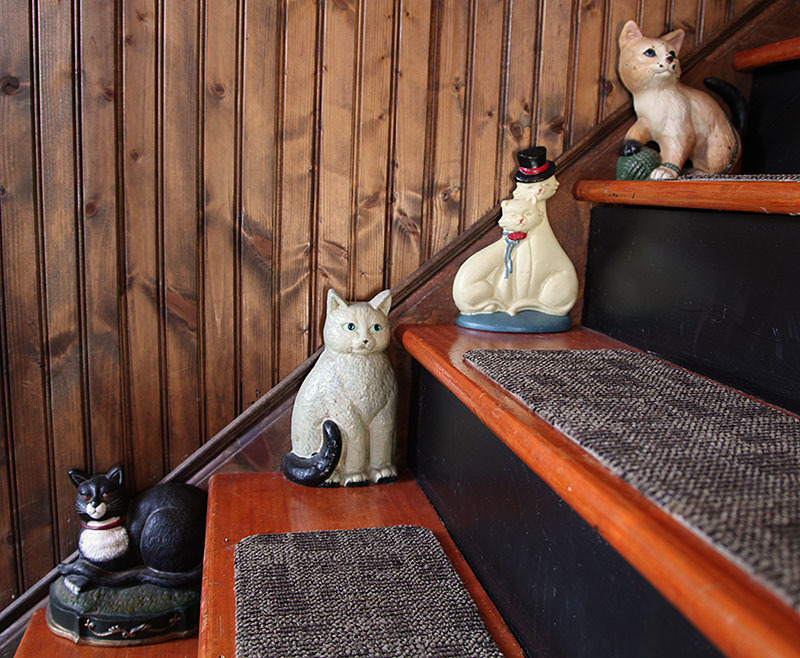 The cat batiks were just fun, so I may try some totes or something like that with the cats. I love using chalk pencils to trace right onto fabrics when I am adding letters or designs to give me an idea on layout and how they look but most are too waxy or break, these are really nice and go on smoothly, so I will let you know how I like them. 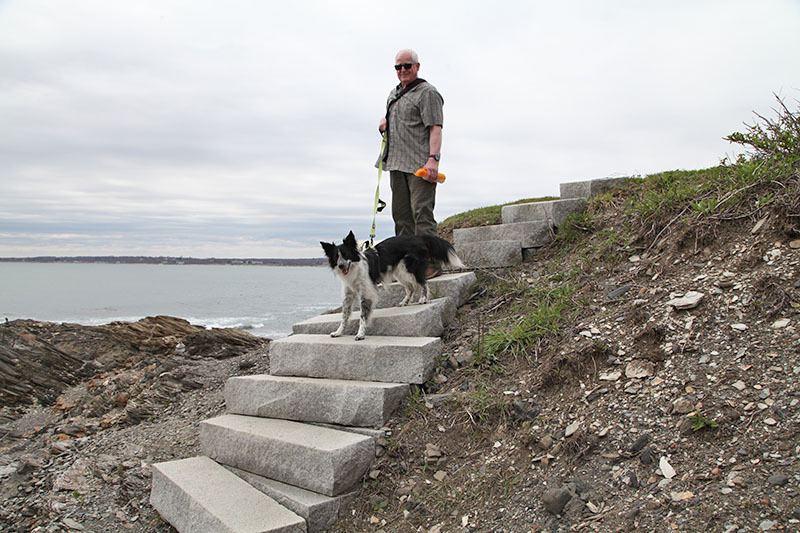 After the show we went to the lighthouse, I promised Bean we would go for a walk. He is really good when we go out and leave him alone, no more cage. We always find him waiting patiently on the couch, for our return. 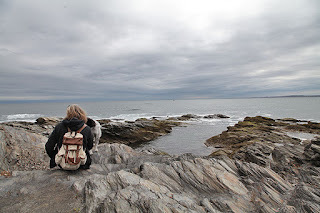 It was cloudy with a light breeze so it was a perfect day to walk around the lighthouse loop without the crowds. This time we walked down the steps to the rocks below, the tide was going out so there was more shoreline to explore. No hurry today, we looked for heart rocks and I found two and it was nice to just sit and enjoy the fresh air. Sunday we went for a ride to Connecticut to visit a couple of campgrounds. One was in the perfect area across from the state park, but the camp was horrid. It looked like a dump, the grounds were never cleaned from the storms this winter and the seasonal sites looked like a scene from Ma and Pa Kettle, lol. 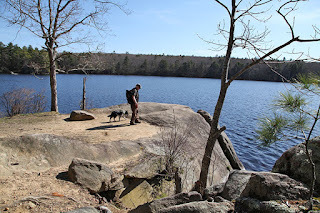 The second was so much nicer and we found a site right on the river that was double the sizes of the others, so we will definitely be visiting on the next nice weekend. We can paddle along the river right from our site. On the way home we stopped at the state park and walked around, but no pets allowed in the beach area or camps. After that we stopped at the lake in RI, it borders both states. 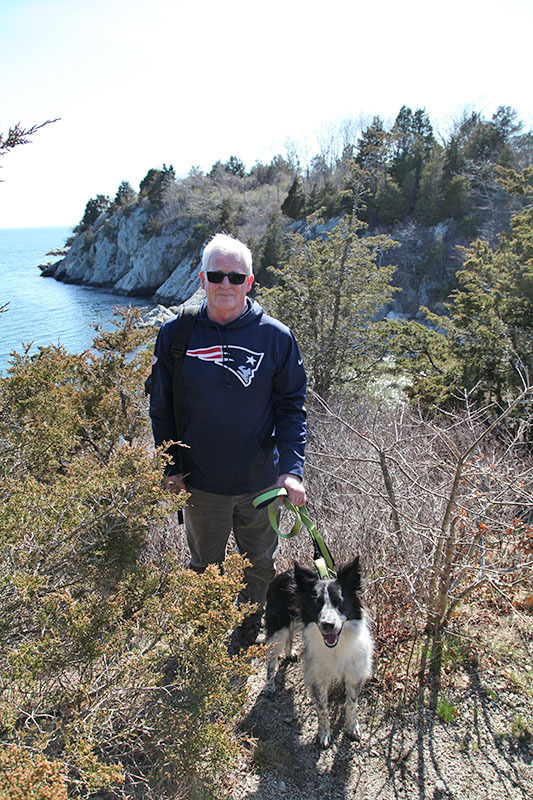 It was the perfect day for a hike and of course Bean loved getting out for a better walk. The path follows the pond and there are some nice spots to stop and enjoy the views. 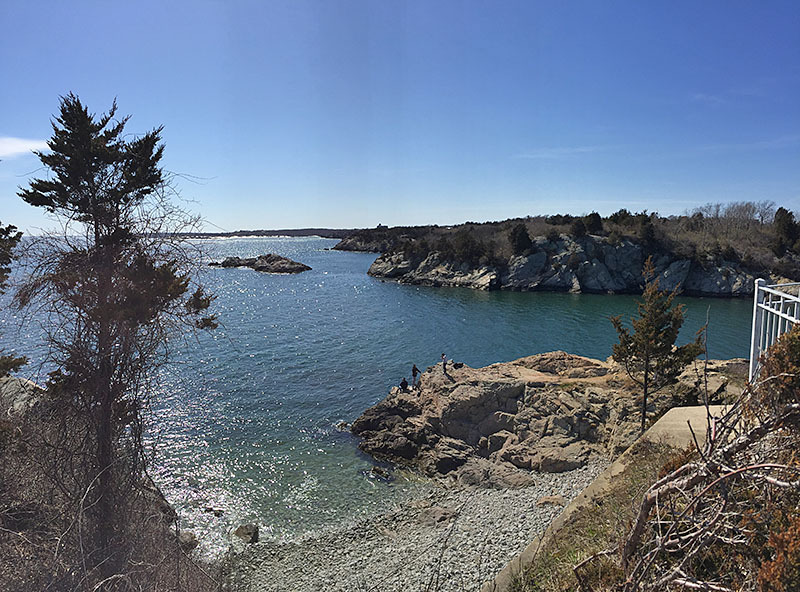 We hiked to the cliffs and climbed up the side to enjoy the views from the top. One thing about Bean is that he is a puller, he likes to take the lead and when we climb, I let him pull me up, lol. It really does help and take the strain off my back, and coming down I lean back and let him pull and that keeps my balance so he is a big help to get me up and down the hills. 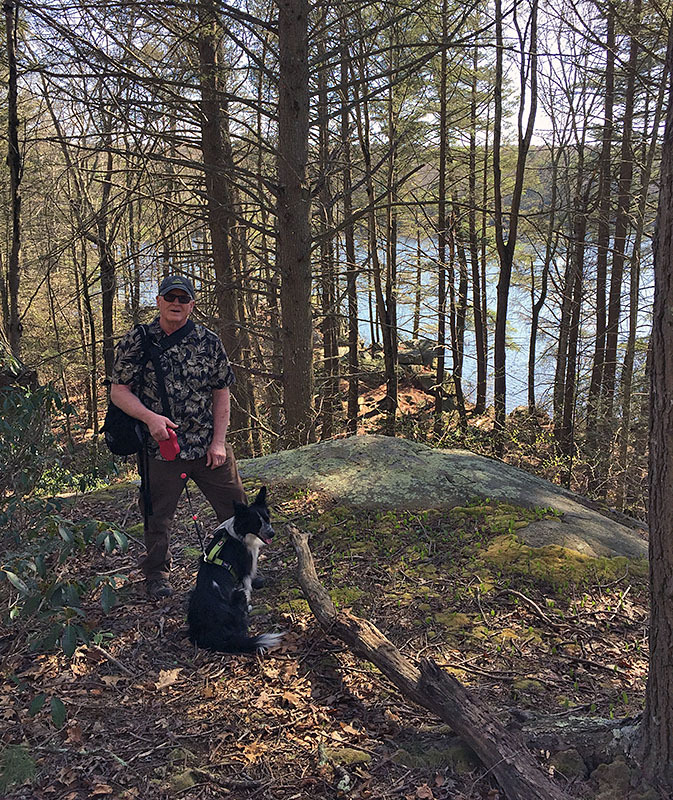 I hope you all had a wonderful weekend and able to get out and enjoy the spring weather. I am loving the cooler temps, great for hiking and a lot less bugs. This week I finished two projects. I tend to start things and not finish them or finish something but not quilt it, so time to finish things and I have a large to do list, so a bit at a time. 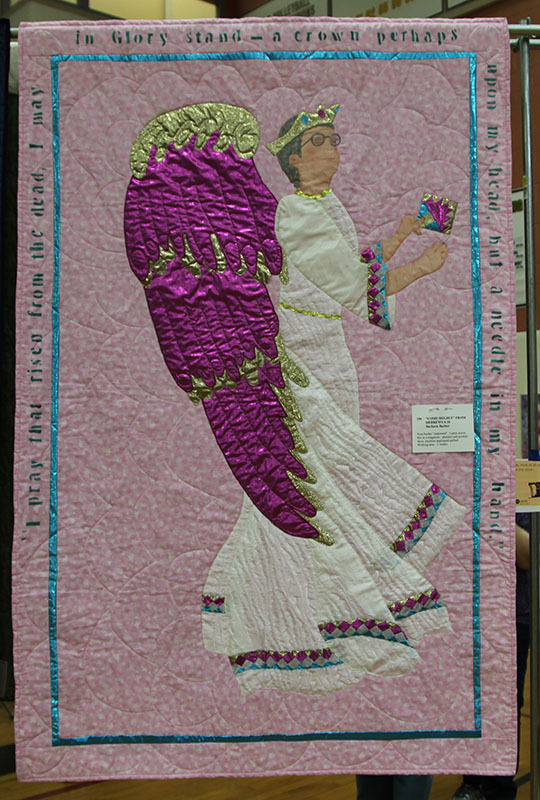 This quilt is a design by Cheri Saffiote and she has offered it for free on her Facebook Page, Quilts by Cheri. The original had eggs in the basket, but I decided to add simple flowers so I could use it for spring and summer. I did basic quilting around the shapes and edges and I was thinking of tea staining it, but that needs time to soak, so if I do it, that will come later. It does look better in person, much darker and prim, but as usual the outdoor photos were too bright and indoor I get light and dark so it makes it harder to see, so it is still a bit brighter than in person. Now I have to figure out where to hang it, time to take down my Easter pieces. 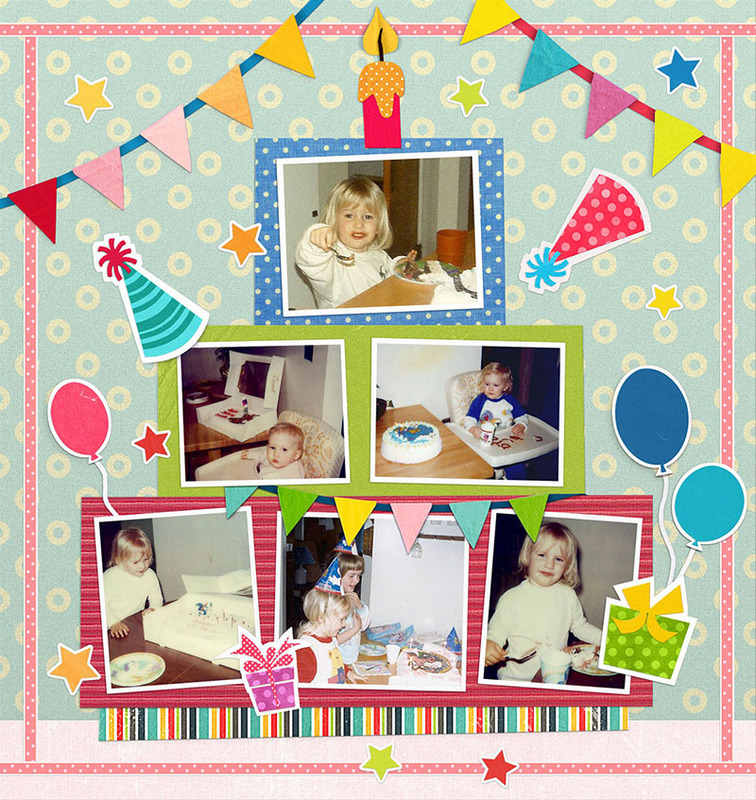 I also realized after I saw the photo again, I forgot to put the stitching on the border. I can still do that, will be a stitch around the inner edge with a dark tan thread. This second piece I made and wanted to frame, but it didn't fit or look right, so I added a homespun edge and simple stitching. I gave it a light staining and it makes a nice mini wall hanging. Another piece for my gift box. 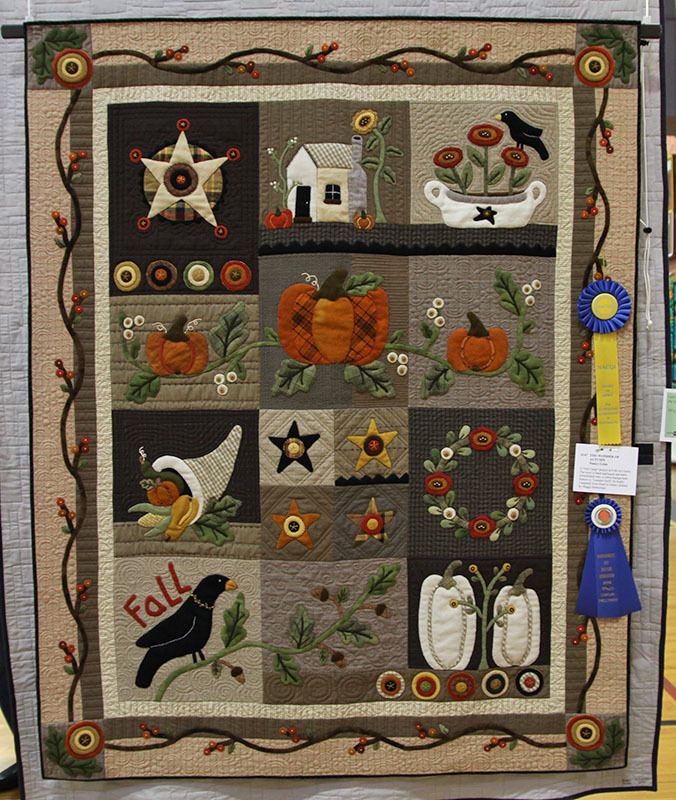 Tomorrow is our local quilt show, they do it every two years, so I will be going. Not a big show but fun to see the quilts and hopefully some new vendors from other states. Hopefully I can get some nice photos, usually people stand in the way;) Have a wonderful weekend and I will be sharing some photos of the show on Monday. This weekend was full of emotions, a year has gone by and Danielle's birthday. I wanted to finish her quilt for this birthday, but by the time my joints loosened back up, it was a few days away and when I took it out to look at it, I realized I had sewed on a few blocks, on four different rows, backwards, so I will be doing some seam ripping before I can sew it together. I will finish it and I will decide what I want to do with it someday, when the time is right. We found some beautiful pink flowers and planted those in front of her gravestone and then we took a walk at one of her favorite spots. It was good for me to do something for her and with her in spirit. 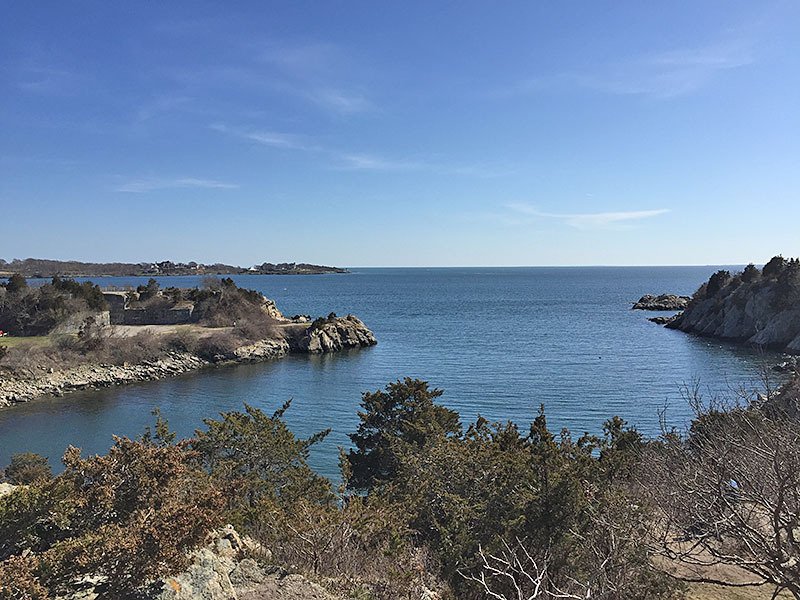 On Sunday it was a beautiful day so we decided to go to the island and walk around at the other forts. 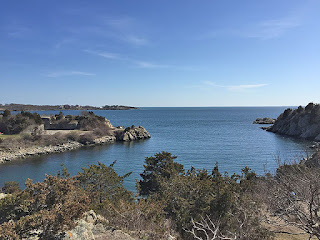 I started out with little energy but once I got out in the fresh ocean air I got some of my energy back and we ended up exploring new path ways at the different areas of the fort. The first stop was the pier in Jamestown. We drive by every time we go there, so this time we stopped and walked along the docks and enjoyed watching the local fishermen and tourists who frequent this area. 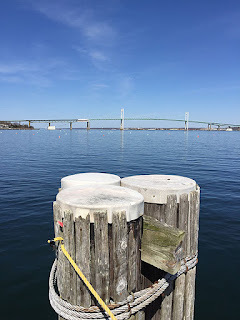 That is the Newport Bridge in the distance. This is a panorama from the top of the forts. There are turrets where the gunners would stand watch and underground bunkers below that I have no desire to go into. 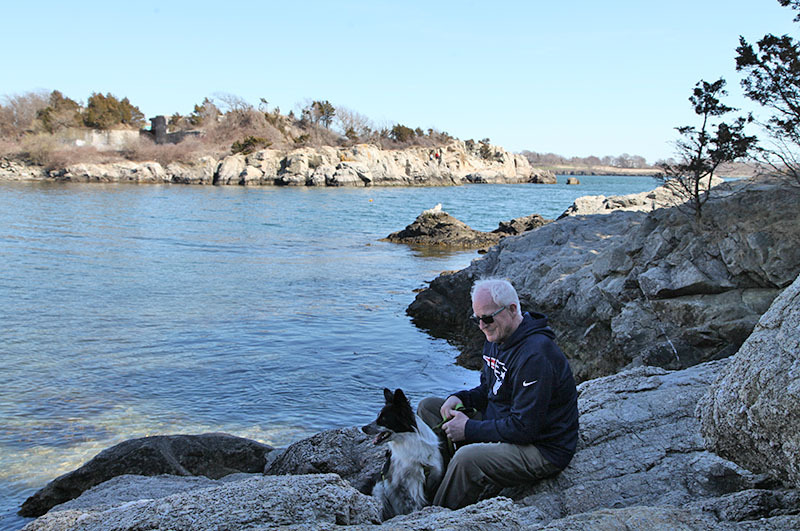 At another section of the park, there is a beach and we sat on the rocks to enjoy the views and Bean was people watching as usual. One area we climbed goes up to a high peak, above where we are sitting, but not much of a pathway, so we just stopped at the top. Bean loves to climb, he is really agile, but also too daring, so we keep him on a short lead, when we are on the cliff areas. We found a new path that took us up to the highest point on the coves, I think I could just sit here all day. And on the way home, we stopped so I could take a photo of the windmill. 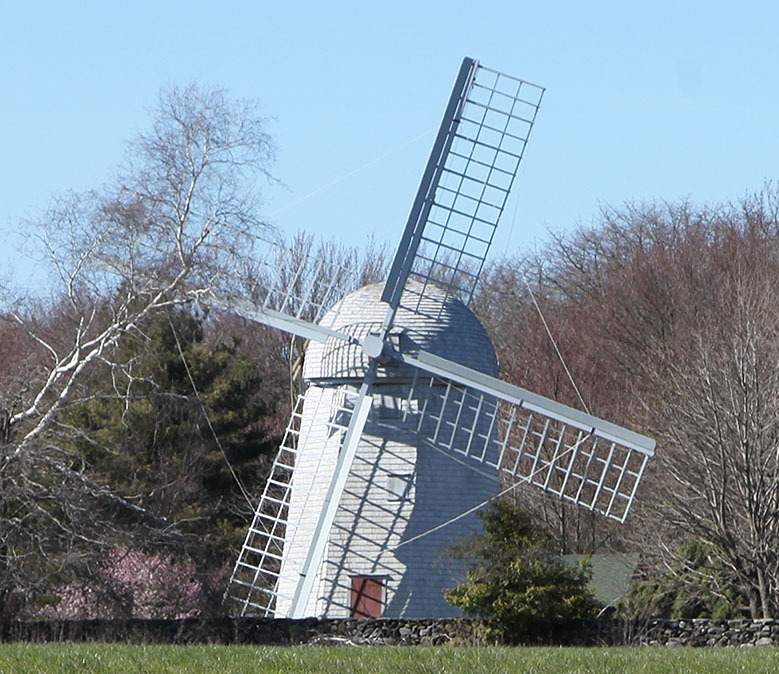 Yes we have a windmill in Rhode Island, at least one. 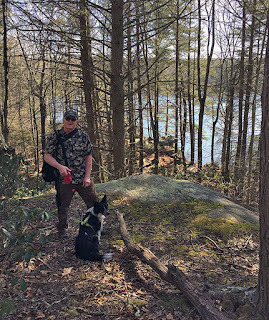 I hope everyone had a wonderful weekend and if you didn't, I hope that you can get out and find the hidden treasures in your area. This week I have been working on several projects. The first is a pillow that I made the top for and never finished, so I decided it was time to finish it. 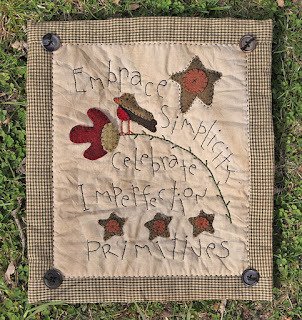 The design is from Rebekah Smith's book, Wool Appliqué. 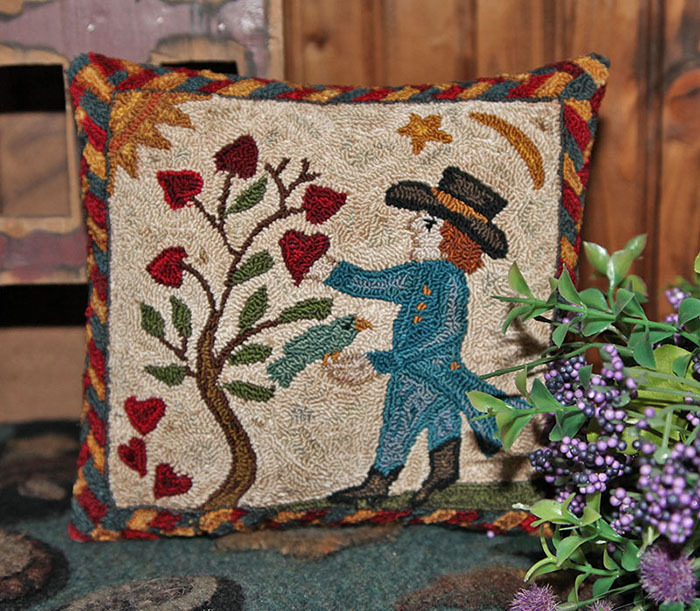 This one I did in full size, but I made the pillow back too small, so I ended up cutting off some edges to fit it better. This one is for me, love kitties and fun to have something new I can decorate with. The second piece I wanted to finish by today, but it does not fit in the frames I have, so I have to rethink the finish. 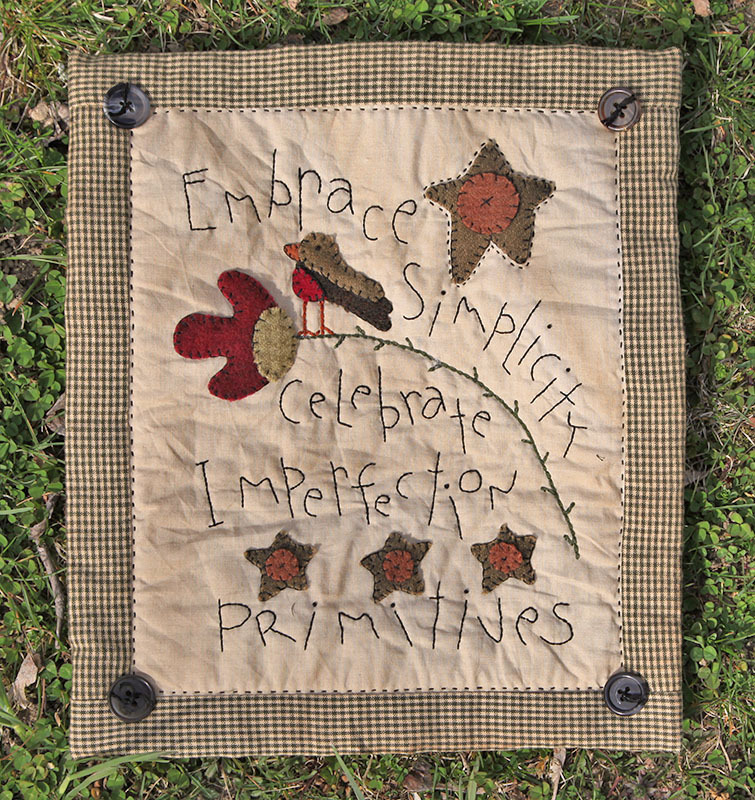 It is a design from the Spring issue of Primitive Quilts and Projects. It was fun and quick to do, just wish I had reduced it a bit so it would fit in the frame better. This will be another item for the gift box. The Winner! 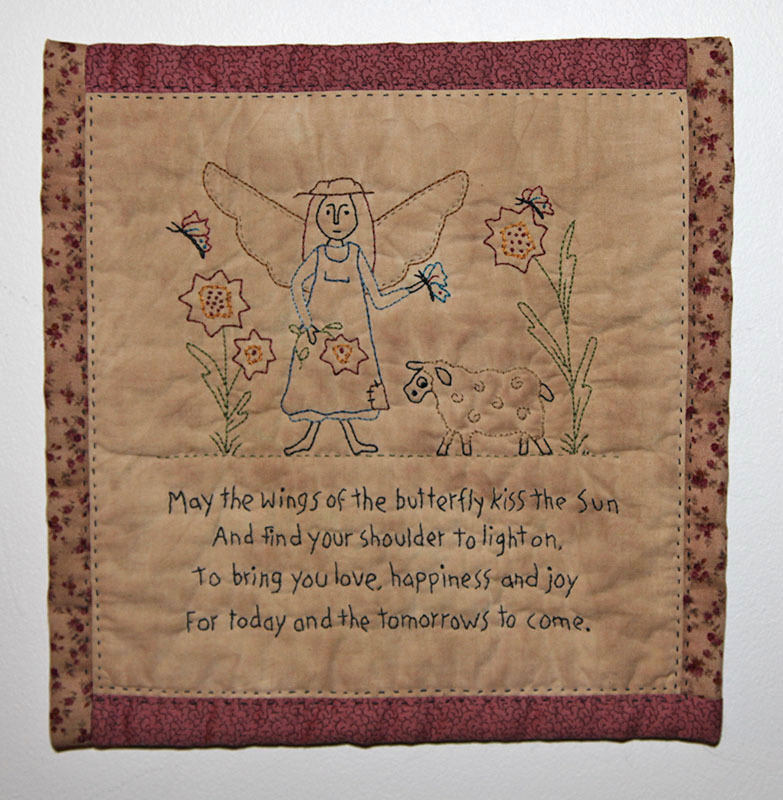 I used the random number generator and #3, Sandi of Shhdesigns is the winner of one of my patterns. Congratulations to Sandi and you can email me with your choice of pattern or booklet. Tomorrow is Danielle's birthday, she would have been 31. 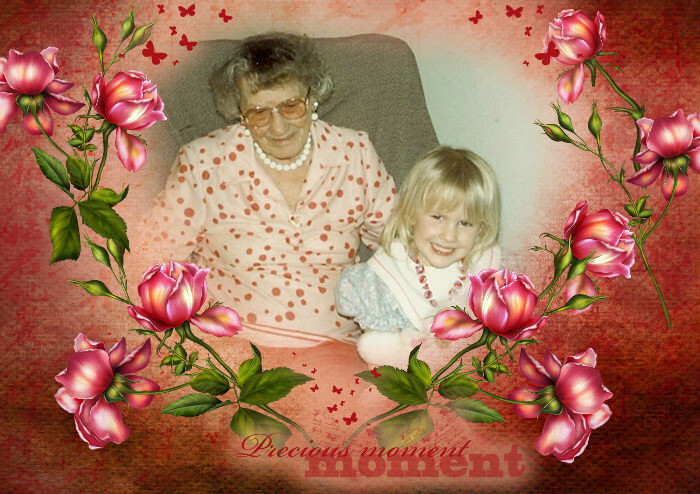 I plan on getting some spring flowers that I can plant in the front of her grave and grow through the summer, but not sure if the stores have them yet. I also want to get out and enjoy this beautiful weather, a nice walk is just what I need. I made up a card for her, it is from her first birthdays. I had forgotten a lot of things and seeing the photos brings back such wonderful memories and years of joys that we shared together. I hope everyone has a wonderful weekend. This weekend I decided to make another small piece to put in my Christmas box. 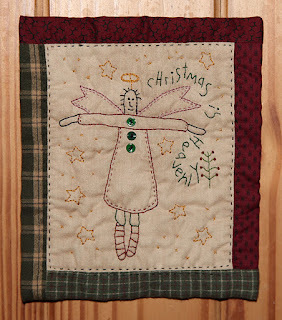 I love Cheri's designs and this one came from one of her old books, 301 Country Christmas Quilt Blocks. You can still find old copies online, but it seems everyone is wanting them now, so getting harder to find. I was lucky and found my copy at a thrift store. I really enjoyed making this one, it is happy and meaningful. I added extra stars to fill in the empty spaces at the bottom and I left it, as is. I am not sure who will get it, so I didn't want to stain it and think that may darken the design too much, I like keeping this one bright and happy. The little quilt is 6 1/2" x 7 1/2". 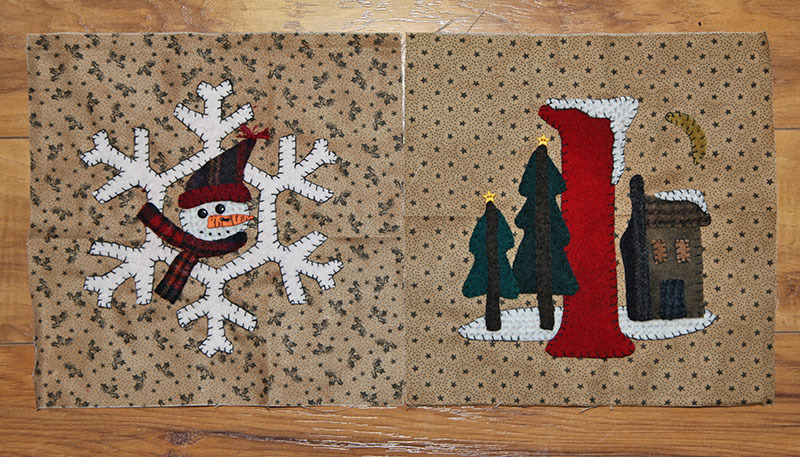 Mini quilts are fun to do, great for small spaces and a great way to use up scraps. Yesterday was a nice day but windy and cool still so we decided to go the the antique barn. It is a nice ride and you never know what you will find. One thing I always look for is cast iron, cat door stops. When you are hunting in a shop full of booths, you have to look carefully, sometimes items are hidden behind other items and guess what I found, a cat door stop. I thought it would be fun to line them on the stairway. Can you guess which one is the newest one? Make a guess and I will pick a name from the guesses. 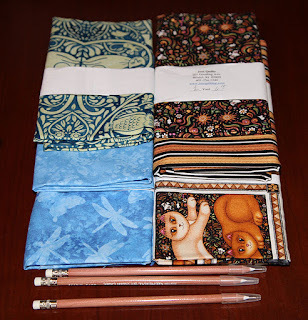 I will pick a name on friday night and the winner can pick any pattern or booklet from my ecrater shop. On top of that, I tried to unscrew a top that did not want to open and bruised my old injured fingers, so no drawing for me right now, the pattern will be done next week. I tried to write today and it was basically scribble, so not enough control to redraw patterns. Of course the flash, brightened up the colors, even though I antiqued it with walnut stain. I was trying the fake lilacs to get the camera to see the colors better and it did help. 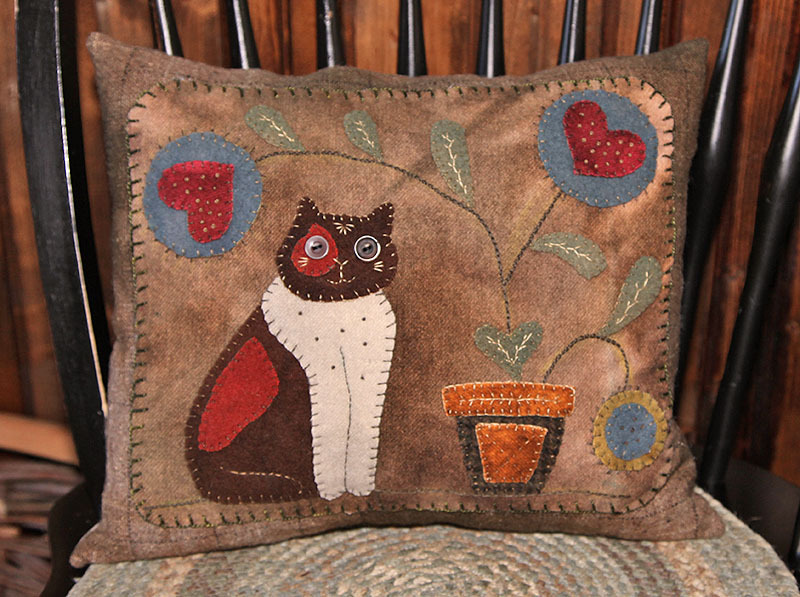 The finished pillow is 7 1/2" x 6 1/2". Hopefully I can get back to normal after this weekend, time to cut off the meds, they mess me up more than the lyme, it seems. Today I posted a photo of Danielle and thought I would share it with you and the poem that I found. This is her great grandmother at Easter. Kids tend to shy away from the elderly and Billy would keep busy elsewhere, but Danielle always sat and gave her grandmother lots of love. She had a good heart and truly cared about other's feelings. who keep long vigil by the silent dust. something to comfort other hearts than thine. and I perchance may therein comfort you. With her birthday coming up, I wanted to give a gift in honor of her kind spirit. A friend of mine is doing a walk and a raffle to help raise money for MS, in support of her daughter in law. 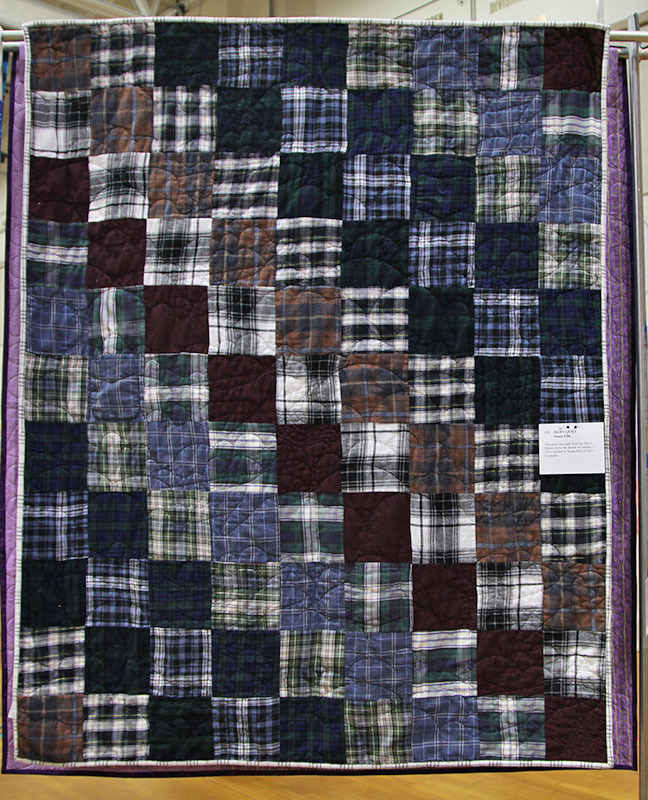 She is offering a beautiful log cabin quilt for the raffle and each 20.00 gets you one entry into the drawing. 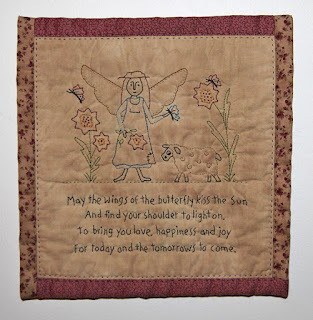 I think it is a wonderful thing that she is doing and if you are interested in contributing to her team and getting a chance to win the quilt you can visit Team Triple Threat. The walk is on the 16th, Dani's birthday, so it makes it even more special for me. 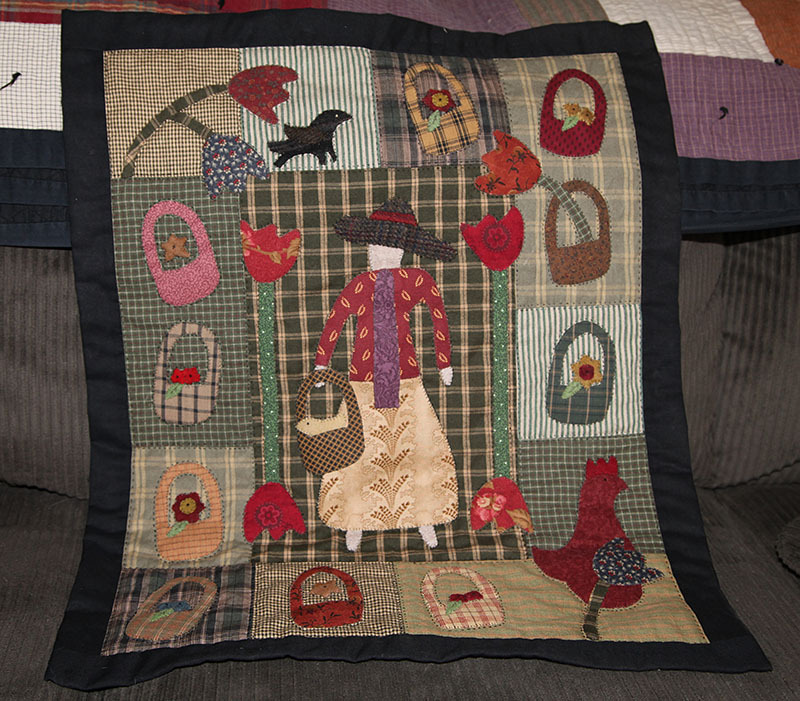 The quilt is no listed on the website, but she is taking all the names from the donations and entering them into the raffle. This weekend I worked on the latest free BOM from Buttermilk Basin. They are really fun to do and work up quickly, I can't wait for the next one, it will be a double, so I can't wait to see what she has planned for the extra longer block. The original calls for a female cardinal but I saw a lot of Blue Jays being done and since my letters are red and we do get a lot of Blue Jays in the winter, I made mine into a Blue Jay. This is what I have so far, I love how they look together and it will be nice to have a beautiful quilt, I can hang for next Christmas. Another project that I started is, a freebie from Cheri's Facebook Group. 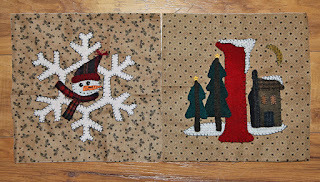 I am doing mine with scraps and homespuns and will decide if I want to make changes, after I sew the blocks together. 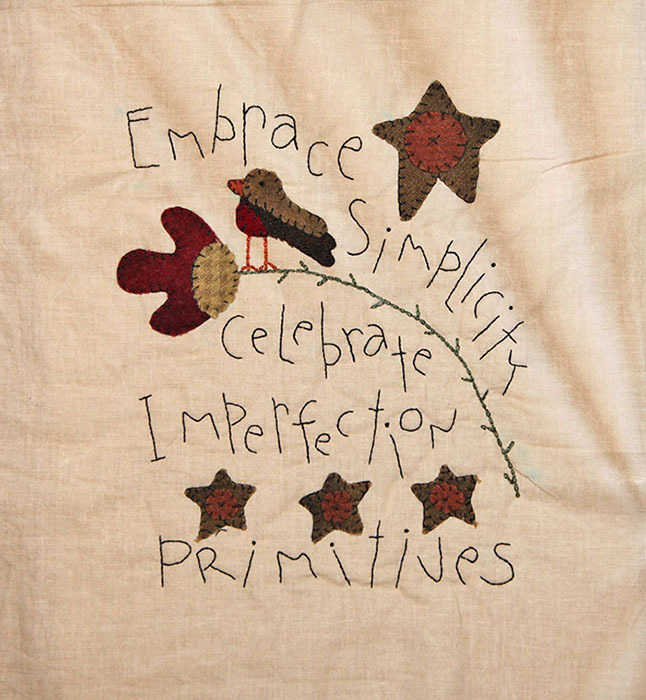 There are flowers and a chicken that will be going on, so I will sew them together next and add those and see how it looks. This is what I have so far, can't wait to finish and hang it on the wall. 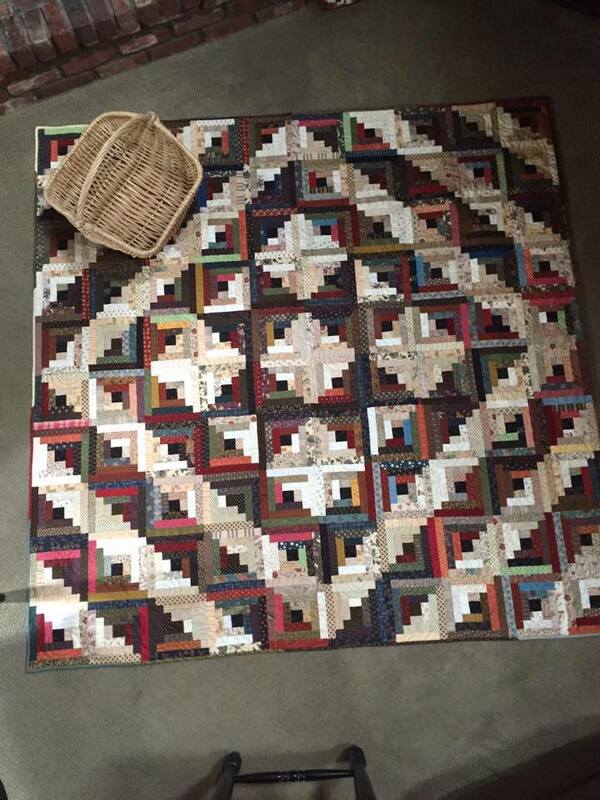 The pattern is called Jane's Baskets. I wanted to thank you all for your good wishes. I am always sick or in pain, but when you live with it as long as I have, you get used to living with it. It has just been a tough year and this is a tough month, and having the support and love from my online friends, means a lot to me. This week I have been having more done time and the lyme has effected my joints and nerves, so it is hard to do fine work or things that take coordination or strength, so I decided to do some more stitchery. This time I went though my old files and found a design I had doodled up, years ago and thought it would be a fun one to try. Of course I had to have a saying to go with it and I found an old irish saying and changed the lines a bit. I was thinking of making it into a design, I need to redo the original and add the saying. I just have to figure out how to get the font to work in the right size and with the photo since my text program had this font and photoshop does not. As usual I had to do a flash photo, so it tends to be too dark in some areas and too bright in others. I aged it with walnut ink, a fun piece to give as a gift. It looks like we will be having some stormy weather this weekend, so no outdoor plans. I am so looking forward to warmer weather and long walks on the beach and lots of paddling this summer.